Escaping the Laboratory with SOMA! SOMA aims to bring together our widespread student body in a way that encourages interaction, collaboration, and fun. The SOMA executive team structure has adopted a format similar to that of the Society for Neuroscience having a past President, current President, and a President-elect. 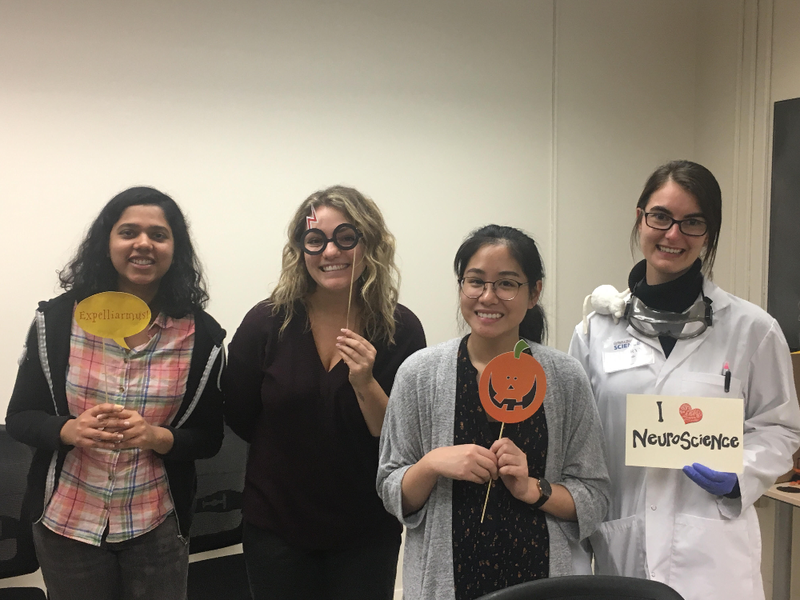 The students currently holding these positions from the Neuroscience Graduate Program are Gésine Alders, Gabriella Mattina, and Ashley Bernardo respectively. This design allows for smooth transitions between years and helps provide support for the entire team. Soon, SOMA will be looking for our next President-elect and we will be sending out a call for nominations. If you are interested in being part of the SOMA team, have ideas for future events and are excited to help us host more events in the future, please put forth your name once the call for nominations is sent! You are also welcome to nominate others that are interested in being our next President-elect! 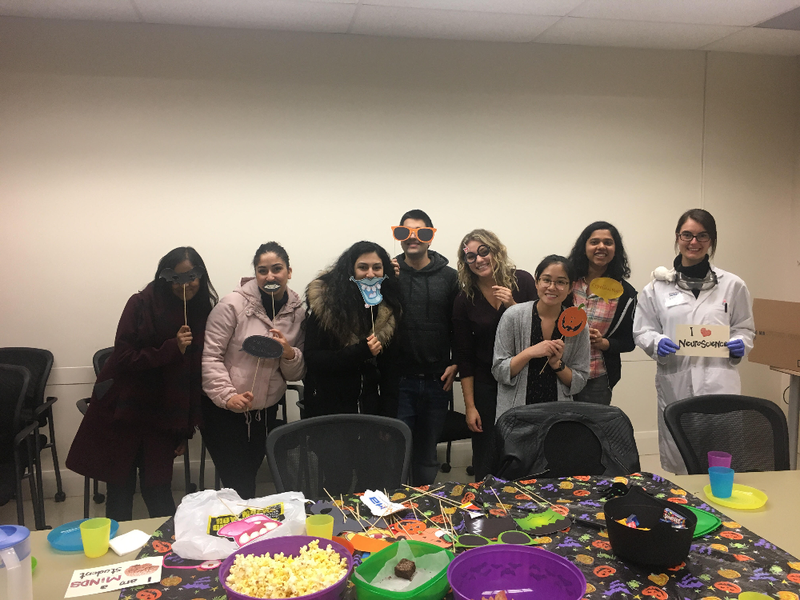 Our most recent event was our Halloween Escape Room held on October 29th. Everyone enjoyed pizza and snacks before entering one of two identical rooms that SOMA created (below). You are graduate students in Dr. Jekyll’s lab. You notice your supervisor has been acting strange lately, but stranger things have happened around grant application deadlines. You were getting ready to clean up and go home Halloween night when all of a sudden you hear growls outside the lab, a lock, click, and an e-mail ping sound from your phone. There are three things you will need to find in order to escape. You have 45 minutes before it is too late - good luck! I was working in the lab late one night, when… Never mind, I don’t have enough time.I don’t want to alarm you, but something is changing and no, it’s not your funding. I have developed a special serum that will help prevent the evil within me. I fear I will change into Mr. Hyde, a creature with no compassion or care for graduate students, who will keep you locked in the lab forever.You MUST create the correct serum and give it to the lab tech at once. I will also require a personal belonging of mine that will help me remember who I am. Also, an abstract is due tomorrow, so I still expect you to show me the significant results.With these three things, I will be able to change back to my regular self and you will be able to graduate after all. 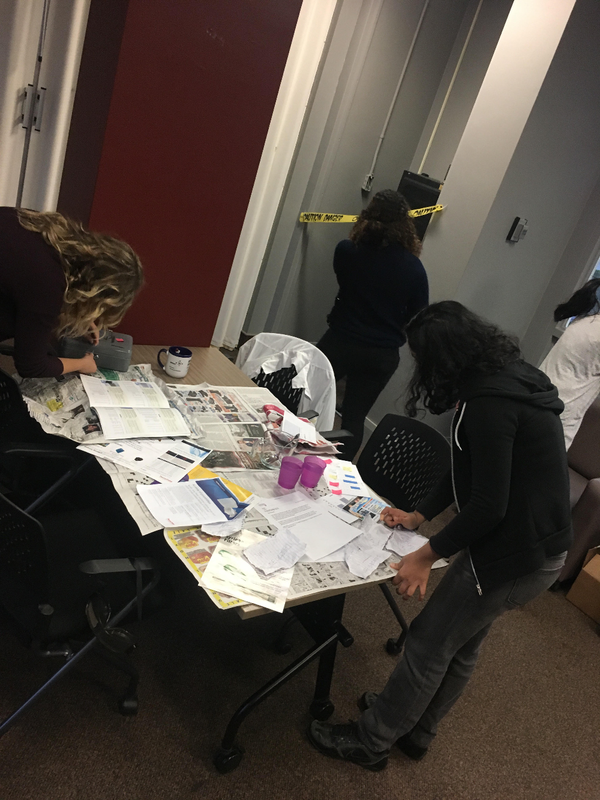 Both teams solved the puzzles and were able to create the serum, find significant results and identify the personal belonging to escape within a minute of each other, having an escape time of 39 minutes! 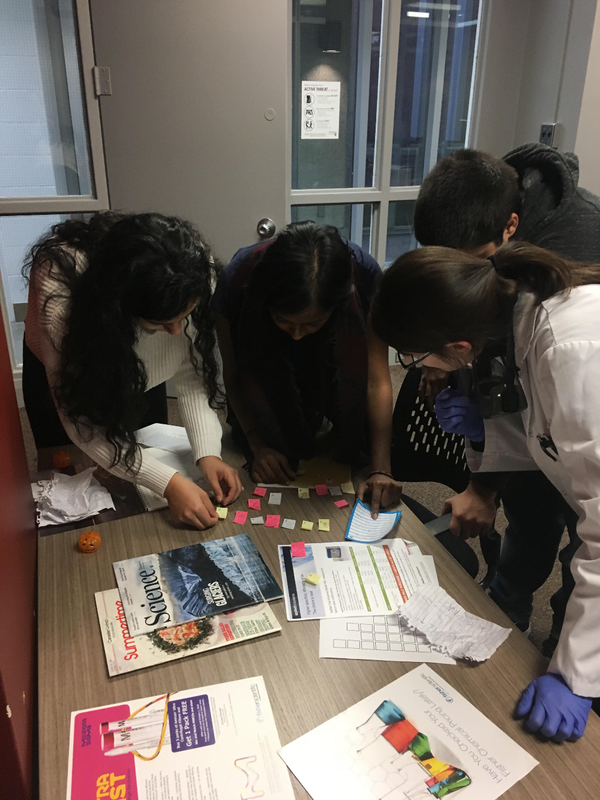 Above: The two teams of Neuroscience students went head-to-head to see which team would escape first! 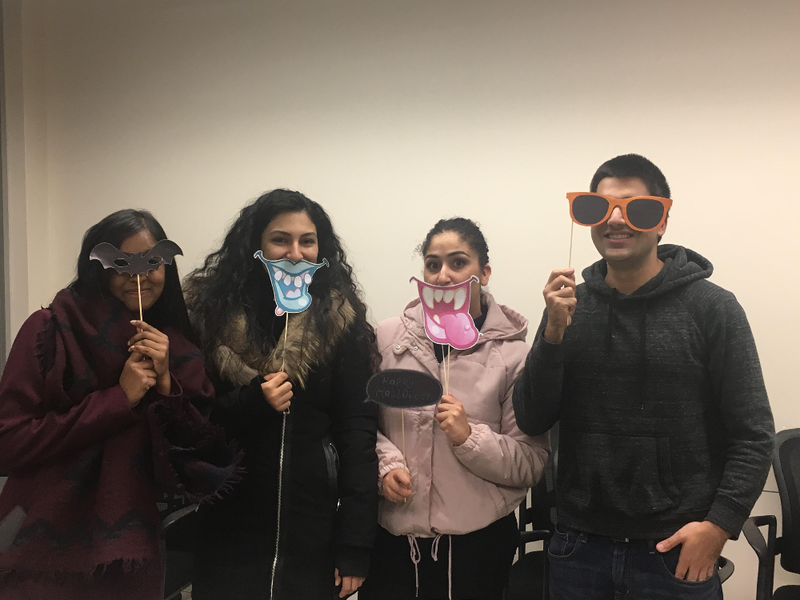 Below: Neuroscience students Nirushi, Yola, Amanda, and Arman (left) and Monica, Nicole, Judy, and Kathryn (right) celebrate their teams' successful escapes! Below: The escapees pose for one last photo (and refuel with more Halloween-themed treats!). 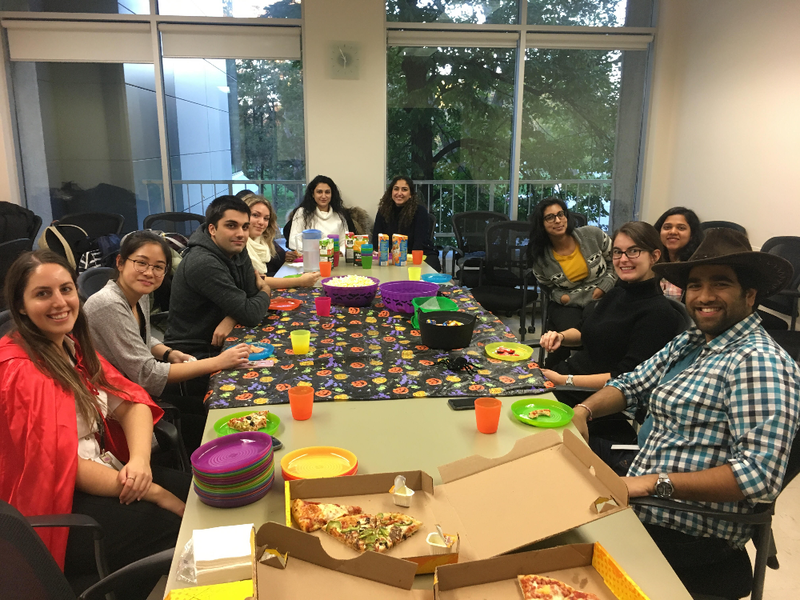 SOMA was thrilled that students were able to come out and enjoy the night and we are looking forward to hosting many more events this academic year, including a work night and our annual Christmas Party! Keep an eye out for our e-mails as there will be more details to follow! You can also check out SOMA's activities by following us on social media (Facebook and Instagram) or by checking out our website!